How should they identify and prioritize infrastructure projects that make the greatest impact on economic growth, social uplift and sustainability? Once they have selected the investments, how should they prepare and procure these assets most efficiently and effectively? Once the assets have been built, how should they operate and maintain them to maximize their value for society? 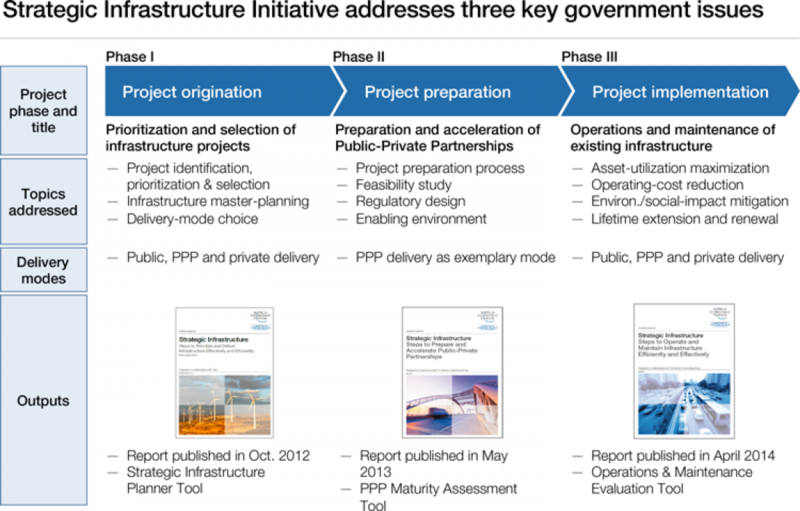 The first phase of the initiative, in 2011-2012, explored the first question and produced the report Strategic Infrastructure: Steps to Prioritize and Deliver Infrastructure Effectively and Efficiently in September 2012. The second phase, in 2012-2013, addressed the second question, specifically looking at PPPs as exemplary modes of project delivery. The corresponding report, Strategic Infrastructure: Steps to Prepare and Accelerate Public-Private Partnerships, was published in May 2013. The third phase, in 2013-2014 and summarized in this report, addresses the third question and discusses in detail issues of operating and maintaining existing infrastructure assets. Figure 3 provides an overview of the initiative’s three phases and their respective topics. The initiative draws on Partners from the Forum’s Infrastructure & Urban Development Industries and other relevant groups, including Mobility, Energy and Investor Industries. Other participants include experts from multilateral development banks, academia, governments and the wider infrastructure community.